Prominent & Leading Service Provider from Hyderabad, we offer rcc saw cutting services, wire saw cutting services, diamond saw cutting services, floor saw cutting services, wall saw cutting services and diamond wire saw cutting services. RCC Saw Cutting Services provides an efficient solution for precision masonry and concrete wall cutting. Powered by electricity, petrol/diesel, our machines are ideal for cutting holes in walls for doorways, windows, reducing wall heights, and forming lift-shaft openings etc. Capable of cutting 750 mm depth, our specialized masonry and concrete wall cutting machines have easy to assemble components so they can be set up almost anywhere. This has many advantages when working space and position of cuts have to be compromised. The diamond saw blade is attached to a saw head mechanism and rotated at high speed to form the cut. 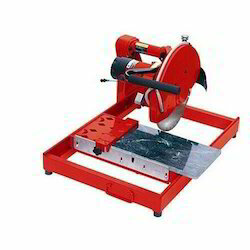 The saw blade cuts the concrete or masonry in small increments, in a series of passes until the required depth has been reached. The most creative tool in the cutting industry is the Wire Saw Cutting Services. Using diamond beads strung on special aircraft cable separated by springs or plastic, the wire can be wrapped around any length, depth, or configuration of reinforced concrete.This lightweight, portable saws have changed the character of building modification. Cutting openings in concrete walls with diamond tools causes no structural damage and requires little patching. The convenience of sawing and completely removing many openings in one day can not be matched by any other method. When used in conjunction with other concrete cutting tools, the wire saw is often competitive in removal dollars or unit cost terms. Diamond Saw Cutting Services is a quiet, non-percussive way of forming holes and openings. The result is free from bursting or spoiling and requires little or no reinstatement work. Water and dust control attachments can be used where a clean environment is being worked in. We tailor our wide range of expert Diamond cutting at Waterloo rail station to your project to help you achieve quality, cost-effective results with no day charge applying. Clients can avail from us exceptional Floor Saw Cutting Services, which are ergonomically designed to ensure comfortable operation over long periods of time. They are provided with a super-rigid box frame that ensures straight cuts, and easy crank for raising and lowering the cutting blade. Equipped with a comfortable and firm handle grip, these are widely employed in highway construction, municipal engineering, construction, stone factories, mines and so on. They have easy to remove and rust resistant ploy water tank, which provides an optimum flow and volume of water to the blade. They are also used to cut concrete pavement, concrete slabs, marble and granite pavement, slate, terrazzo and other brittle hard materials. 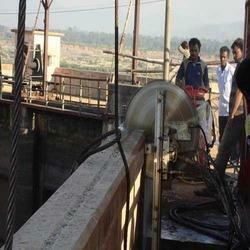 We avail the demand of our valuable clients, we are engaged in offering a supreme range of Wall Saw Cutting Services. Our efficient manpower and quality products which are used are at peak of our client's satisfaction. The most creative tool in the cutting industry is the Diamond Wire Saw Cutting Services. Using diamond beads strung on special aircraft cable separated by springs or plastic, the wire can be wrapped around any length, depth, or configuration of reinforced concrete. This lightweight, portable saws have changed the character of building modification. 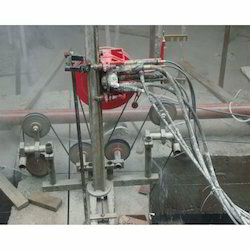 The dustless, vibration free ability of the Wire saw to cut with a diamond blade has made pneumatic breaking obsolete. Cutting openings in concrete walls with diamond tools causes no structural damage and requires little patching.